Home » News And Events » Products knowledge » What is AS1428.1 regarding stair nosing? What is AS1428.1 regarding stair nosing? ★The full title is Australian Standard Design for Access and Mobility Part 1: General requirements for access – new building work. ★This Standard sets out minimum design requirements to provide access for most people with disabilities and addresses a wide range of building design elements. ★Clause 11 of the Standard specifically addresses requirements for stairways and stair nosings and in this regard focuses almost entirely on promoting luminance contrast at the leading edge of step treads together with the avoidance of overhang at the front of stair treads. What does AS1428.1 say about stair treads and stair nosings? ★Stair nosings are not allowed to project beyond the face of the riser. ★Stair nosings must be continuous across the full width of the stair tread. ★Stair nosing profiles may have a sharp intersection or a radius up to 5mm, or up to a 5mm x 5mm chamfer at the tread/riser intersection. ★A luminance contrast strip that provides a strong visual clue of the tread/riser intersection must be included. ★The strip needs a luminance contrast of at least 30% with respect to the background material. ★The luminance contrast strip must be between 50mm and 75mm wide and cannot be set back from the tread/riser intersection by more than 15mm. 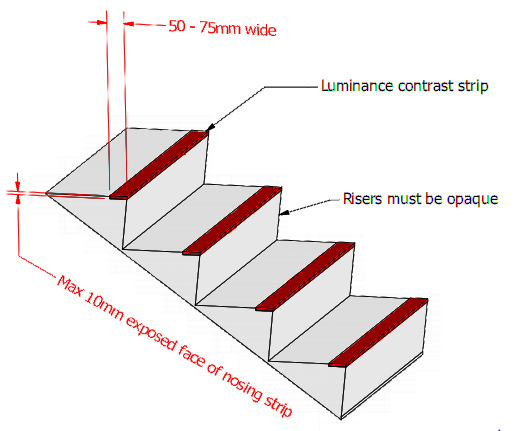 ★When located at the front of a stair nosing, the luminance contrast strip cannot extend down the riser more than 10mm. ★Stair risers must be opaque.